Former U.S. Marine Corps Staff Sgt. Elizabeth Perez served in the military for 10 years. She worked as a mechanic on the F/A-18 Hornets with Marine Fighter Attack Squadron 112. She repaired night vision goggle and mine sweepers. She deployed to Afghanistan in 2003 with the Ohio Army National Guard. Perez, 40, was honorably discharged from the Marines in 2009 and fell in love with a soccer coach in California. She got married and immediately started a family. But her husband Marcos Perez, now 46, was in the U.S. illegally. He was detained after a traffic stop and deported in 2010. “My oldest son was five or six months old when my husband was deported, and I was pregnant with my second son,” Perez said. The Perez family will be the subject of a PBS Documentary airing April 15, “Marcos Doesn’t Live Here Anymore.” The film follows Elizabeth Perez through her struggles to raise the family in the U.S. without her husband. Perez said she hopes it will show how hard separation is and humanize a topic that has become so politically charged. Former Army officer and paratrooper was deployed to Afghanistan when he missed a key immigration deadline for daughter. One of her fellow Marines, former Gunnery Sgt. Stephanie Vielle, 36, met Elizabeth in 2007 when they were both assigned to VMFA 112. She wanted to help. Perez “was always on point. She knew everything about being a Marine,” Vielle said. When Vielle found out Marcos was deported, Vielle accompanied Perez to the U.S.-Mexico border to ask the U.S. government for clemency. Vielle had some familiarity with the immigration system because a lot of her junior Marines were either immigrants themselves or had immigrant spouses. Perez stayed in the U.S. initially. Then she tried moving the family to Mexico to be with Marcos, but did not feel safe. So she and the children moved back to her hometown of Cleveland, Ohio. 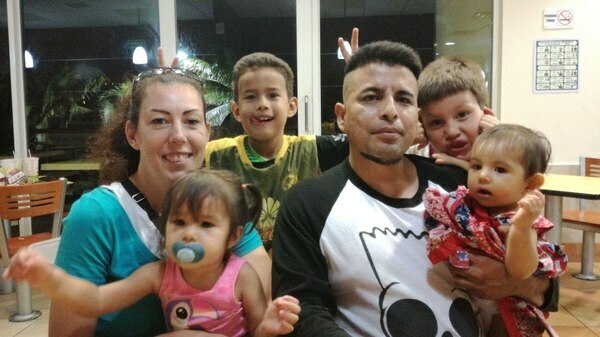 For the last nine years, she has raised their four kids alone, staying connected through regular flights to Mexico and video phone calls. Over the decade, Elizabeth Perez has sought humanitarian parole for Marcos. She has sought help from her state and congressional representatives, who did not help. She knew nothing about the U.S. immigration system when the deportation first happened, and ended up wasting thousands of dollars in attorneys’ fees learning there are few options for her. “He has minor misdemeanors. No felonies. Nothing crazy.” Perez said, without specifying what the charges were. “I don’t like to talk about it, because people will make their justifications and their judgments when they hear ‘Oh, this person did this. He has misdemeanors so it is okay that he was deported.’ But it’s not." It’s a film about possibility, too — because Marcos Perez has almost completed the entire 10 year immigration ban on re-entry into the U.S., which is one of the conditions of his deportation that must be met if he is ever to be reconsidered for a visa. Elizabeth Perez said he has never tried to cross back into the country since his deportation, because they wanted a chance at a clean slate next year and legal entry. “I want him to come here, and just be free, and not be worrying, can he ride his bike to work? Can he drive?” without the risk of getting detained, Perez said. “We just want to live our lives free and boring and normal. I want him to come here with papers."